Come… one day only flash Pop-Up sale with special guest Vivienne Jones. We're happy to share a drink and show off our wares. There is new fresh inventory, including the 'Honey Bee' print and I'm introducing a linen, cross-back apron, a take on the traditional Japanese design. Also new mixed-media such as Goddess in Green, pictured below and some new encaustic panels. Sale! 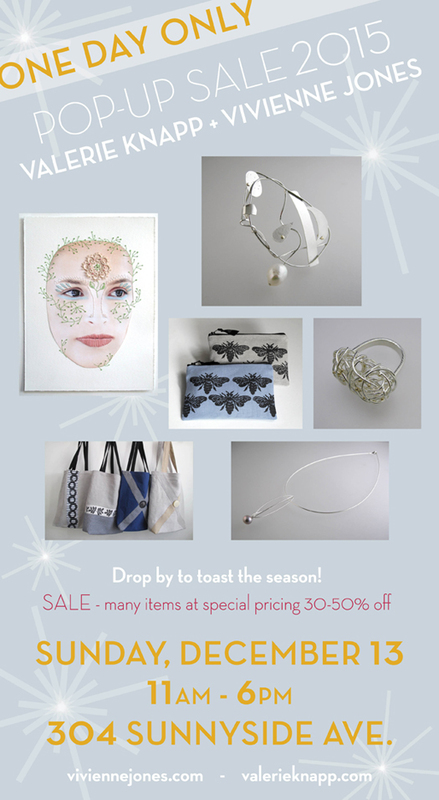 We're both offering markdowns on some of our favourite things.… LOTS of great stuff, in time for holiday gifting. Also, you can visit shops stocking my recent product collections: The Craft Ontario Shop at 119 Cumberland St, in Yorkville, or the Craft Ontario Gallery, 990 Queen St. West near Ossington, where you'll see my work alongside numerous other wonderful things.